British Soldiers, Sepoys, Pathans, Ghazis and Afghans in action amid a series of high-profile ScenoSquares of mountains, passes and rivers (bridges) with a Medieval fort, Pathan watchtower, Pathan village, Tuggee temple and Indian city. This is one of my most extensive offerings of scenic splendor with many alternative set-ups and scenarios. Lots of interesting figures of an intriguing historical period: The 2nd Afghan War and the Btitish with their Sepoy allies in combat with the Pathans, Ghaznis and Afghans. 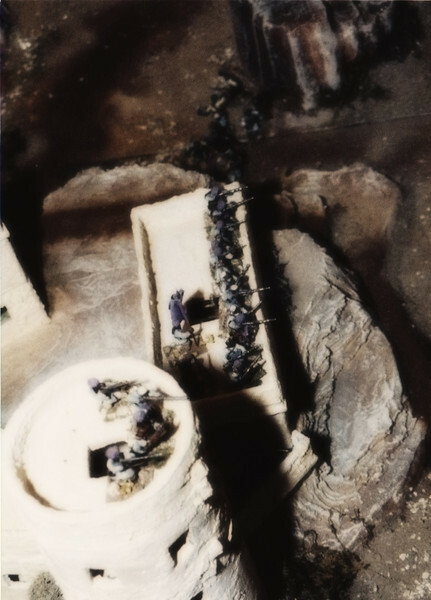 5 Infantry units (20 each) in specific colored facings. All rifle-armed and relatively “trained”. a style to match Frontier line of yesteryear. The Afghans may also be used as a Maharajah’s Personal Retinue Army. They are a very useful Colonial adjunct force for many purposes. Figurines are in individual unit boxes 3” x 11” x 12”. Fieldpiece or Mine 3” blast circle for determining those involved. Fieldpiece 6” x 1 ½ “ oblong for cannister or maching guns potential. 1” circle for grenades. Personality Initiative Card Deck of many different matching and identified color cards including all the personalities mentioned in the unit descriptions. Draw from deck to establish sequence. Rules adaptations from the original Sword & Flame to the convention-acclimated Duke version. This is an extensive catalogue of ScenoSquares (2 ‘ x 2’ tiles) designed primarily for use in a geomorphic configuration with a few having more limited facings. Common facings allow a variety of set-ups to be utilized with these tiles. This subject features a number of high-profile pieces with only oner ScenoSquare in a box due to its height. The boxes are like bookbinders with a basic dimension of 2’ x 2’ x 1’. Cut-down versions of these boxes are used as master cartons for the figurines. Coding is on the back of each section. This “SPARSE” terrained grouping uses both arabic numbers and letters. Indian City is more verdant terraining. 4 Base Lifters 2” thick Scenos meant as under-placement to elevate mountains/pass etc. 3 “Flats” terrained as desert. Sand is used to covet joints but no point in shipping sand to buyer. The Northwest Frontier, India is a complete game package - perhaps my most complete.